With a private walkway linking it to The O2, this luxury London hotel is ideally located for anyone with tickets to an event at the domed arena. Unique features such as a 3,100sqm pillar-free ballroom and its own bespoke Clipper Gin make the InterContinental London - The O2 an exciting addition to the London hotel scene. This luxury hotel is a stone's throw away from the renowned Greenwich entertainment venue. Part of the 7.6-acre regeneration scheme on the Greenwich Peninsula, the InterContinental London - The O2 is the closest hotel to the domed entertainment venue, making it the ideal accommodation option for those visiting concerts and events. The 18-storey, 453-room hotel offers unparalleled views across The O2 and east London, with floor-to-ceiling windows throughout the rooms, bars, restaurants and bathrooms - who doesn't love a toilet with a view? Rooms are contemporary, with granite bathrooms and chic wooden accents, while maritime and market-inspired touches pay homage to the history of the hotel's location. The hotel also houses one of Europe's largest single event spaces - an impressive 3,100sqm pillar-free ballroom, which can hold up to 3,000 guests. With the ability to split the space into a number of different sections, it's ideal for everything from business events to BRIT Award after parties. Enjoy spectacular views over Canary Wharf while sipping on cocktails. Boasting spectacular views across the Thames and Canary Wharf, the Eighteen Sky Bar is a sophisticated spot to enjoy a cocktail or two. Found on the 18th floor of the Intercontinental London - The O2, the bar is open to both hotel guests and visitors and serves a range of cocktails, international craft beers, specialist wines and champagne. The cocktail menu is inspired by spice, herbs and botanicals, with exotic options such as the Kryptonite, with elderflower liquor, absinthe, rosemary infused honey and citrus; Sky Gazing, with kaffir lime infused gin, sweet wine, apple juice and vanilla syrup; and the Perfect Storm, with pisco, liquor 42, egg white, ginger and lemongrass. There's also an Asian-inspired food menu of sushi, sashimi and steamed buns. If you're lucky enough to grab a window seat at sunset, the Eighteen Sky Bar has all the ingredients for a magical evening. The hotel's main bar boasts huge floor-to-ceiling windows and an arresting marble bar. A striking showpiece within the InterContinental London - The O2, the Clipper Bar is the hotel's main bar and boasts 270-degree views of the River Thames. Huge floor-to-ceiling windows give it an al fresco feel and a maritime decor pays homage to the hotel's Greenwich location - the hotel even has its own bespoke Clipper Gin inspired by the inaugural imports to the London Docks. An arresting oval marble bar is the centrepiece of the room, where guests can order a full range of wines, draught beers, signature spirits and cocktails created by world-class mixologists. An afternoon tea menu is also available with a choice of 34 loose teas from The East India Company. An open plan kitchen and market-style trollies provide an interactive dining experience. The Market Brasserie provides an interactive dining experience inspired by the original Greenwich trading markets as well as Billingsgate, Smithfield and Covent Garden markets. An open plan kitchen, where fresh bread and pastries are made daily, takes centre stage, and impressive displays of British cured meats and sides of smoked salmon are a clue as to what's on the menu. With food served from market-style trollies, the restaurant is open for breakfast, lunch, pre-theatre and dinner. Guests can choose between regionally sourced meats and fish from the British Isles while dessert options are typically British, with treacle tart, apple and raspberry syllabub, Bakewell tart, and lardy cake among the options. Floor-to-ceiling windows and the chance to witness your meal being cooked in the theatre kitchen ensure there's also plenty of visual entertainment on offer. A fine-dining restaurant with modern European cuisine. Adopting the name from its location, the Peninsula Restaurant offers dramatic views across the Greenwich Peninsula and Canary Wharf. 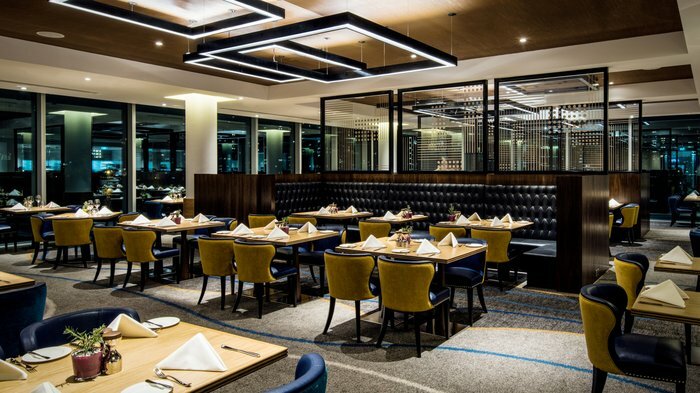 The elegant restaurant offers a more peaceful and refined dining experience within the InterContinental London - The O2, with a fine-dining menu of modern European cuisine with a hint of exotic flavour as a nod to the spice trade that once passed through the London Docks. Hidden behind a moving bookcase is a private dining space for up to 24, with the option of splitting it into two smaller rooms for 12, and the whole restaurant can be hired out for corporate bookings in conjunction with a booking of one of the hotel's meeting spaces. This bright lounge is ideal for afternoon tea or a relaxed meeting. Appropriately named to reflect the hotel's location in Greenwich - a destination marking the starting spot of every time zone in the world - The Meridian Lounge is located in the lobby of the InterContinental London - The O2. A bright open space with large doors leading onto an outdoor terrace, it's the perfect spot for a leisurely lunch or relaxed meeting. The terrace boasts views across the Thames as well as heaters and fire pits, ideal for those wanting to enjoy an evening tipple or al fresco supper. Open from 6am, guests can visit for breakfast, lunch, afternoon tea and light evening meals. The hotel's business centre is home to one of Europe's largest single event spaces. One of the unique aspects of the InterContinental London - The O2 is its conference centre, which includes one of Europe's largest single event spaces, the Arora Ballroom. At 7.2 metres high and a staggering 80 x 39 metres - that's just shy of a football pitch - the Arora Ballroom has been designed to be as flexible as possible. The main space can be adapted into multiple configurations, accommodating smaller or dual-purpose events, and soundproof walls ensure the venue can play host to more than one event. It can also be used in conjunction with the 19 additional meeting rooms on the mezzanine floor, which boasts views across Canary Wharf and ingenious foldaway partitions that make the space incredibly adaptable. The ballroom also has dedicated guest lifts, stairs and escalator access to each half, along with heavyweight vehicle lifts. Find tranquillity in the heart of the hotel. From cheap budget places to stay to luxury 5 star suites see our deals for hotels, including DoubleTree by Hilton London - West End from 42% off.